So along with any other holiday, I have to bring you a tutorial. I used to loooove St. Patricks Day when I was working at Finnigans, but since then I have been kind of blagh about it. I miss that place, the people there and all the laughs I had. I really do. It's been a little over a year since I worked with all of those people and it seems like yesterday. I miss them all more than ever. Hopefully we will be able to all get together again soon, but for now I can always smile thinking about the times I have had. 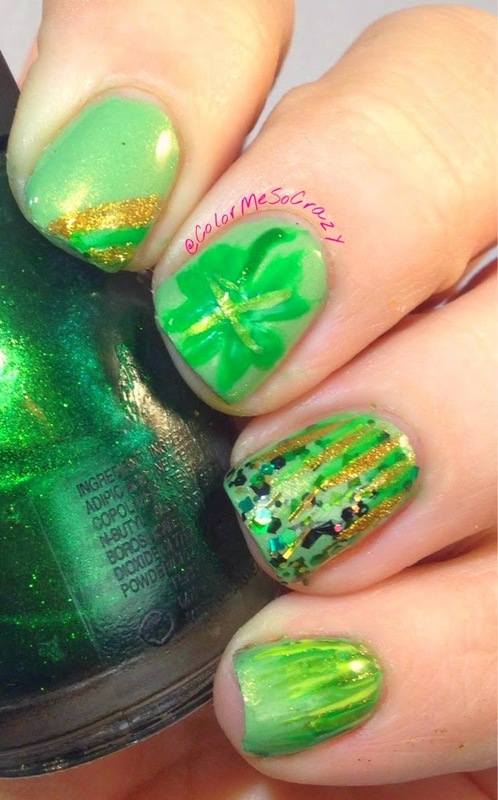 For my fantastic St. Patricks Day mani I decided to do a little skittle. I also have some tutorials to show you a little later today. Be sure to stay tuned!! 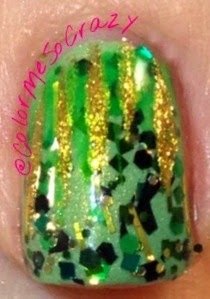 I did a simple half french striper with some gold and green. I used my BEGL for the base for all of these. 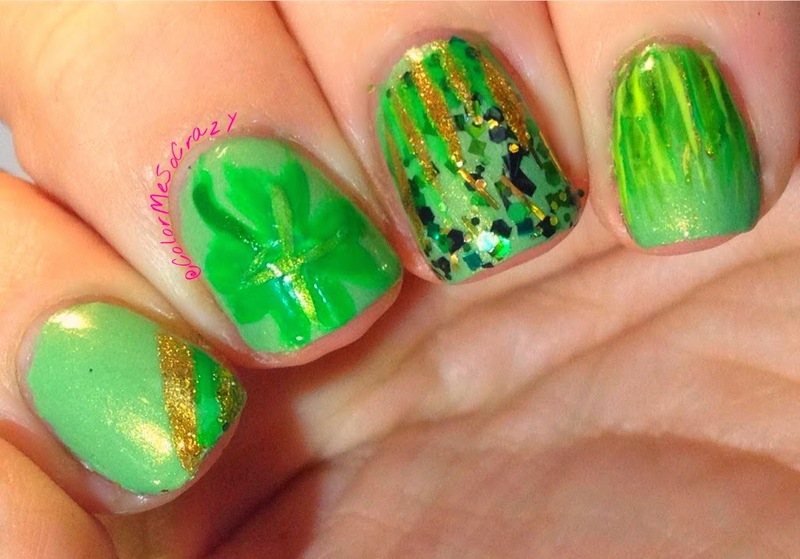 Next, I used my Shamrock tutorial to do the middle finger. 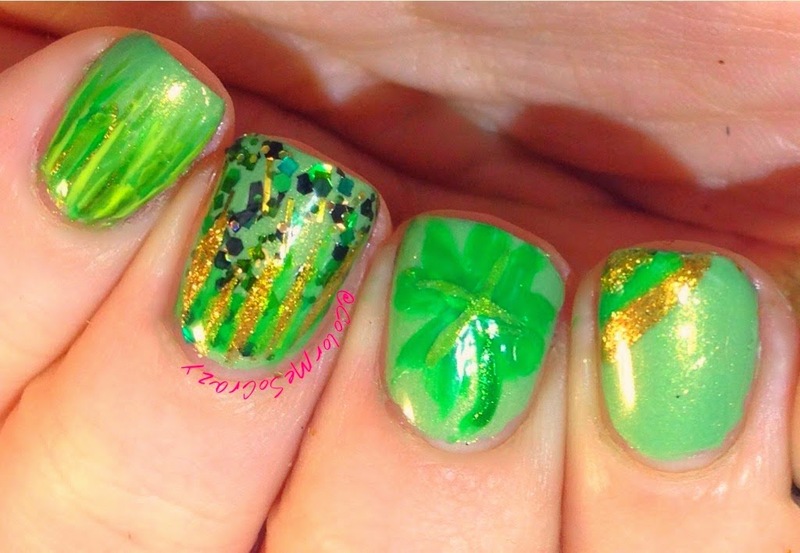 It is a more 3D looking shamrock then a cartoony one. I always like to do more realistic art then cartoonish. My brain just doesn't work like that. For my ring finger, I used my favvvorite indie brand. Sad to say, she is no longer making polishes, but I will still love all that I have from her. I topped it with some gold streaks. 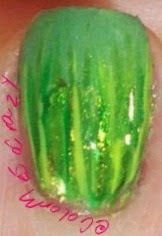 It is my preview for my pinkie nail. Last, my pinkie. I did a multi-green waterfall. I swear I have so much green because I hardly ever use it. I really only use it for plants in art over the summer, St. Patrick's Day and Christmas.